When I traveled to India in the fall of 2007 to study and observe Unani Medicine, and to speak at a Unani medical conference at Aligarh Muslim University, I met many students at Aligarh’s Tibbiya College, or faculty of Unani Medicine. 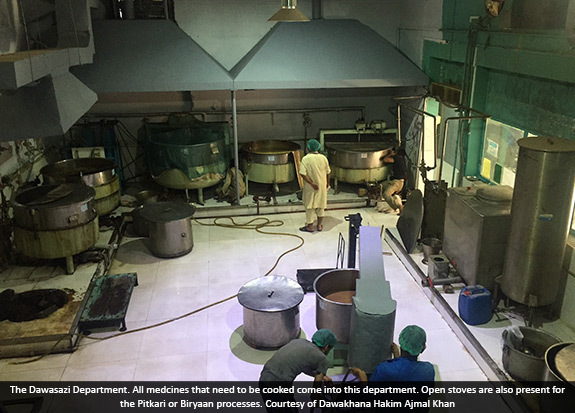 Most of them had been learning Unani Medicine since childhood, being trained and prepared by their fathers to take over the family business; they were just attending school to obtain their license or get their “papers” as a Hakim, or physician / practitioner of Unani Medicine. In the Indian subcontinent, Unani Medicine has been a traditional healing art that was patronized by the Mughal emperors and Delhi Sultans ever since they invaded and conquered northern India. 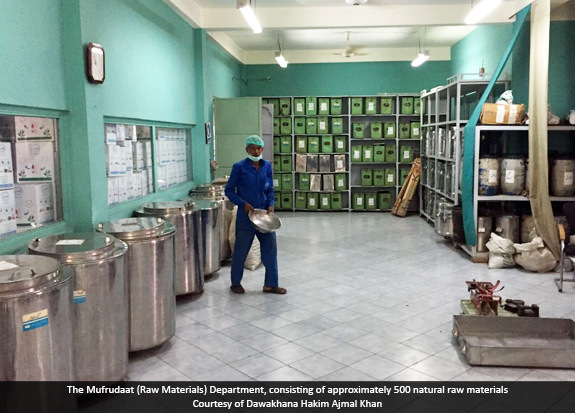 Now, Unani Medicine, largely through families of practicing Hakims, is practiced in towns and cities throughout India and Pakistan, all the way from Chandigarh in the north to Chennai (Madras) in the south, and everywhere in between. When one thinks about it, what more natural setting could there be in which to learn a healthcare discipline like Unani Medicine than the loving, caring and nurturing environment of the family? We trace our lineage from the first Caliph of Islam, Abu Bakr As-Siddique (PBUH), one of the closest companions of the Prophet Muhammad (PBUH). However, due to a lack of surviving evidence, we only claim our lineage from Khwaja Ubaidullah Ahrar, with whom the lineage is represented by strong evidence of passed on artifacts and published books. Khwaja Ahrar was from Bukhara in present day Uzbekistan, and he became the 20th in the golden chain of spiritual transmission of the Naqshbandi Sufi order - 20th in the chain that begins from Prophet Muhammad (PBUH). As King Babur of the Mughal Empire invaded the Indian subcontinent, our forefathers came with him as spiritual advisers. By practicing the art of Istikhara (a prayer for spiritual guidance), they advised the emperor at dawn whether to go to war or not. After the conquest, the family changed professions and became royal physicians. The first Hakim to excel enormously in the field was Hakim Sharif Khan, whose innovations are still practiced today. His crowning achievement was the compilation of all the recipes (nuskhas) used throughout the kingdom. This book 'Biyaaz -e - Kabir ' is still widely used today, with no similar book in such detail. From Hakim Sharif up to my generation all of us have studied and are practicing the same art. My name is Ajmal and I am the fourth Ajmal in the family. My grandfather named me after the Masih Ul Mulk (Healer of the Nation), Hakim Ajmal Khan, who was one of the most popular hakims of his time. I am sure we can’t even dream of having the skills possessed by our forefathers. Every generation of our family has mastered four disciplines: religion, medicine, spirituality and philosophy. In my generation, I have seen some major challenges that were not faced by previous generations. Sometimes at work, patients who do not know much think I am the 'real' Hakim Ajmal. Those are indeed big shoes to fill. Firstly, I am the first generation who is unable to understand ancient medical treatises that are in Farsi or Arabic. This is primarily due to our western education. In the days before the partition of British India, Arabic and Farsi were considered compulsory in order to survive in the professional world, just as English is an international working language today. However, I have embraced this challenge as I learn naturopathy. I believe I will be the first to bring together the age old concepts practiced by my family and the concepts practiced in modern naturopathy today. Also, objective research today in the form of clinical trials is solidifying and validating our practical experience. For example, a study on Majun Dabeed ul Ward and its effects on the liver. Secondly, in the fast paced world of the 21st century we need (more accurately the market demands) faster healing - faster healing of the symptoms accompanied by a gradual decrease in the illness' root cause. The advent of globalization is also to our advantage. We can source raw materials from all around the globe. Unani has been using herbs from Eurasian regions but we will introduce herbs from South America and other remote places. Thirdly, I practice with my father as usually a disciple must practice at least a decade with the teacher. Just like this, the skills have been transferred from father to son for ten generations. In essence, I feel my duty is to act as a bridge between the archaic knowledge of the past and the objective scientific practices of today. Forging this link successfully will be my biggest challenge. In the past, at least in Pakistan, those who attempted to modernize have failed miserably (in my opinion). 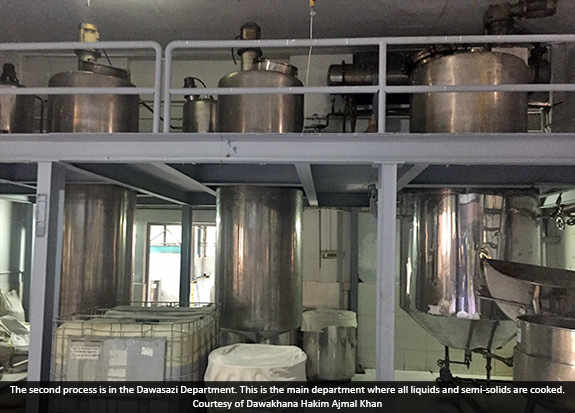 This is because some introduced pharmaceutical practices in Unani (like herbal injections) while others introduced the use of standardized extracts. It is sad to see that the last three presidents of the National Council of Tibb in Pakistan were all pharmacists. We must stick to the original theories of Greek Medicine, including the use of whole herbs and simple processing. It is through this way only that we can make medicines closest to nature. After my grandfather, my father was the only one to practice Unani medicine. Today he is the head Hakim of the family in charge of business matters, practicing medicine and most importantly looking for ways to introduce new cheaper medicines onto the market. One of his most recent products is a treatment for Hepatitis A, B or C. It has been very beneficial in our own trials and now the product has been released onto the market. Hakim Mushir is of a very simple temperament. By his nature he practices Hikmat (The Way of Wisdom). Every day, I see him wake up at four AM, where he begins his day with the practice of Sufi Zikr (the repetition of holy names). After sunrise, he eats fresh fruits and then after two hours he would have a proper breakfast. He is a pescetarian, consuming fish as his only meat, and at nine he starts seeing patients, which he does until 1 PM. 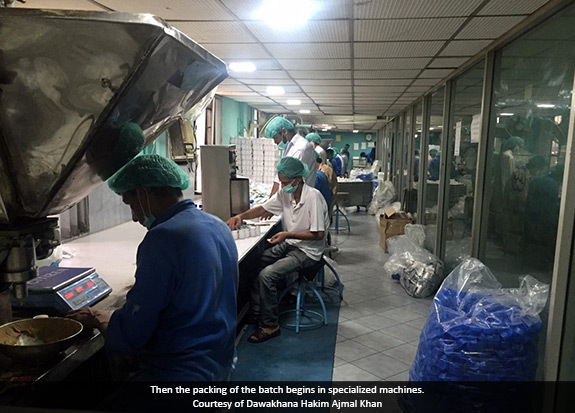 At one, he goes to the factory to look after business matters and see patients there. There is a lot to learn from him. Hippocrates once said “الطب قياس وتجربة “ (Medicine is knowledge plus experience.). The family’s prime focus on this sentence has been to an unprecedented measure. Medicine is indeed ‘.. knowledge and experience’. Knowledge passed on from previous generations not only includes the words penned down by great Hakims, but also their clinical experiences, which add up to the larger reservoir of research. I remember sitting with my father, and how he used to cure multiple diseases with a single herb. All cures are already in existence as nature balances out health with disease, and it is up to us as Unani physicians to search for the truth in this confusing and obscure world. At the moment, we are funding a historical study on the life and lineage of Hakim Ajmal Khan. We will by next year get two books on Hakim Ajmal Khan translated into the English language. 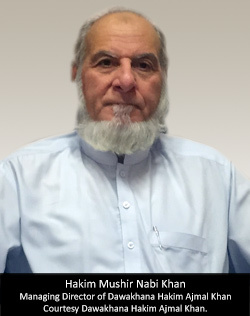 Dawakhana Hakim Ajmal Khan is constantly researching newer drugs and finding new treatments for diseases. 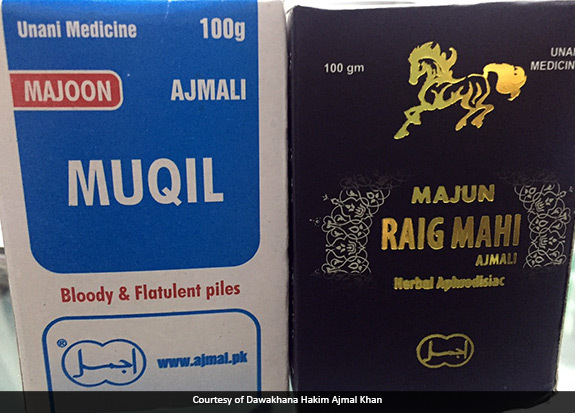 One of the pioneering medicines of today’s age is Kabid Ajmali (Ajmal’s Liver Formula), a medicine formulated by Hakim Mushir Nabi Khan who worked on the formula for 8 years and personally lead its clinical trials. 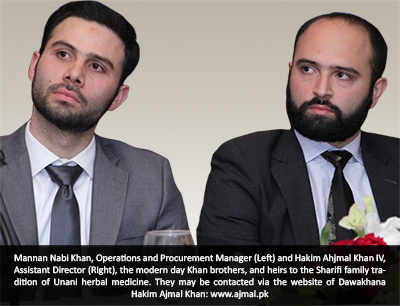 Kabid Ajmali treats all three types of Hepatitis, namely A, B and C. The medicine was launched recently at the Lahore Hukama Lunch arranged by the company. Majuns are relatively easy to manufacture. 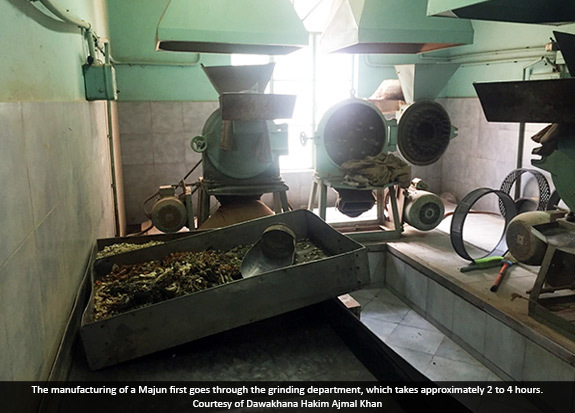 A majun would typically go through the Raw Materials Department, Grinding, Dawasazi, Mixing, and then finally to packing. Once it has been packed, it would be inspected for quality and dispatched to the warehouse. There are many varieties of Majun, like Jawarish (exclusively used for digestive problems) and Itrifals. 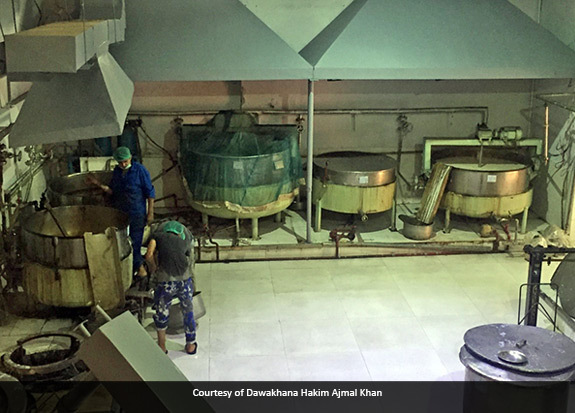 For our Majun, first its base must be cooked, which is the Qawaam (Sugar Syrup). Sugar and water are cooked for 4 hours until they reach 35 bricks (a measure of viscosity). 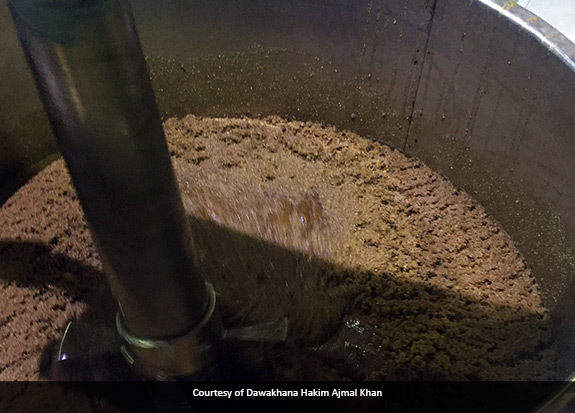 Once the Qawaam is cooked, the Sufuf (granules or powdered portion) of the Majun is mixed in. And the final product would finally come out.